If your old faucet is leaking and you would rather replace it versus repair it, or if you are remodeling your bathroom or kitchen and want to simply upgrade the faucet, the “Installing a New Faucet Ebook” will walk you through the installation process. The “Installing a New Faucet” Ebook provides easy to understand, step-by-step instructions, on how to install a new faucet. Pictures are included for every step of the process! Order Now and Immediately Download the Installing a New Faucet EBook today! 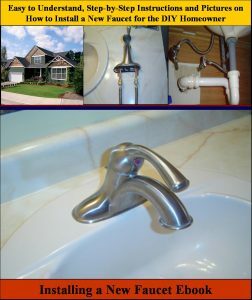 The Installing a New Faucet EBook costs only $11 and is 100% guaranteed. you need for your project.